Now that I've polished my Java skills over the past couple years I wanted to come back and improve a previous project of an XYZ CNC machine that was controlled by Arduinos and a crude PC Java program. This is the hardware I'm using. I've covered how to build all these pieces in earlier blog posts. As I work through the pieces I'll refresh the info on the hardware and sketches. I'll need to make some software updates to the Arduinos, but the original Arduino sketches are posted on my download pages. I want to improve the handshaking, auto detect the arduinos, and process HPGL files better, plus make a better GUI. There are three Arduinos. 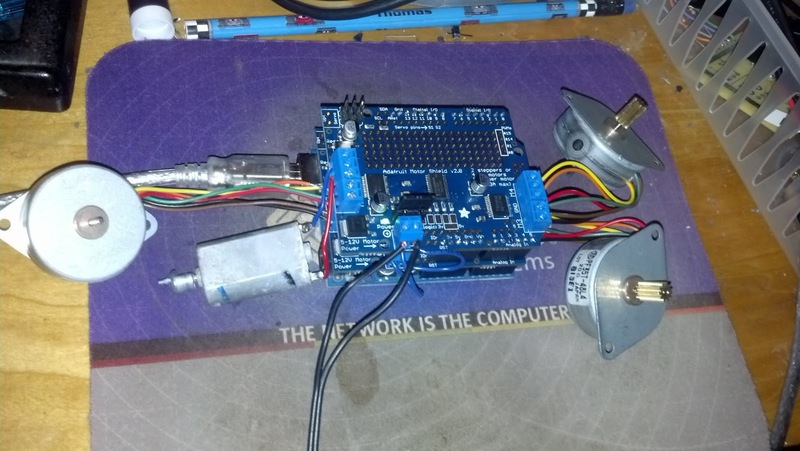 The first is the XYZ motor controller that uses two motor shields from ADAfruit. I posted a hack on how to attach two to the same Arduino. I also replaced the motor driver chips with some higher capacity chips and put on heat sinks. The reason one arduino does all this work is I absolutely want to synchronize the x, y and z moves. I don't want to risk dropping a move or mistiming a move due to USB communication glitches. This arduino gets HPGL format commands that give position from and to commands and it calculates all the sub stepping to get there. The second arduino only controls the speed and direction of the cutter. The cutter is a cordless drill motor and chuck controlled by some heavy duty MOSFET switches. The third arduino is connected to position encoders and an LCD. It reads back the position and also displays it and any other messages the machine has to say. This is mostly used as a watchdog, since the steppers count position. If the position gets off from what the machine thinks it should be I should stop and let the user figure things out. Power is supplied by a old PC desktop power supply. My PC original control program was very crude and didn't work if the Arduinos were in different COM ports and didn't have file spooling capability. I'm way better at coding now, that was my very first program after "Hello World". So my project this time is to write a respectable java program that will work for everyone, It will read/spool in a standard HPGL command file and control the CNC. It will also have buttons for manual controlling the CNC. I'm using Java and the netbeans development environment, which is free from oracle. I'm starting with the basic Java serial tool I just wrote for the PC that will communicate with the Arduinos. The first piece will be a startup routine that finds all three Arduinos and establishes a link. Each arduino sketch will be updated to send an initialization sequence I can look for. After that there will be a choice of entering manual mode to push buttons on the GUI to move, or load an HPGL drawing file. There should be a routine for setting the home position. I fired it up with the serial tool and the original code in the post is working fine, the encoder is constantly spitting out the position on the COM port as fast as it can. For now I shouldn't need to alter the Arduino sketch. My PC program will have to seek and identify this data stream and map it properly. First step is to perfect the serial port autodetection. I'll use the touchport command and then look for a unique broadcast from each Arduino in order to assign them to ports. After a long stall, I finally got this working in a recent project. I had been hung up from a mistake. I used touchPort, to get the port names, and then instantiated a serial class to talk to each one. However that process wiped out my list of ports so the loop failed. Also I learned I have to wait and let the listener have time to hear each Arduino before moving on. Here are the basic pieces. This routine below grabs each port and sets up a listener and sets a flag that breaks the loop above if the desired character is found. I don't have to break the upper loop, I could go back and set up the port at the end of looping, but this is faster if I stop when the right port is found. I've updated the serial Arduino tool with a field for the character is it going to look for to connect. In this picture the GUI has three Arduinos connected. One is transmitting Z, one is busy, and one is transmitting A. The one transmitting Z , COM4, is grabbed and now send and receive can begin. Now I will use multiple of these tools to search and connect to the three Arduinos. I've got that code working, each Arduino is set to broadcast a different character to be found by the serial comm port scanner. However that means I had to resurrect the old arduino code and modify it. I had no trouble with the encoder program https://code.google.com/p/arduino-java-xyzcnc/downloads/list, the rotary encoder sketch. I was able to add the establishContact() function from the Arduino serial response example. that library seems OK, but my modified AFMotorA.h library for use in stacking shields is broken. maybe I need to remake it. The big problem turned out to be that now Arduino installs to the Program Files (x86) directory, which is read only and blocked by default. I had to make all the library files unblocked by right clicking and selecting properties. In the process I did remake the AFMotorA library. All I did was search and replace AFMotor for AFMotorA and AF_Stepper with AF_StepperA, and microsteppercurve to microsteppercurveA in the .cpp, .h and keywords files. Also rename the files AFMotorA.cpp and AFMotorA.h. Now the old sketch compiles pointing to the AFMotor libraries. I'm using three instances of my serial tool with only slight modification. One for each arduino. Had to do some mundane coding to pass the serial responses up to the main Arduino GUI by adding listeners to each of the serial port GUIs and passing them up to the main GUI. The connection process takes so long that I want to move it into a thread by itself rather than locking up the GUI for 15 seconds. that fixed a lot of weird problems I was having with the GUI not drawing, messages not scrolling etc. Cool, now I have a main GUI that when you press connect, runs out and finds 3 different Arduinos and scrolls a log of what it is doing. This simple task had eluded me for a while due to stupid mistakes. Now the fun part, re-writing the code to actually move the XYZ machine. Updated the code to pull the position from the Arduino, parse the string and display it. I'm finding the response time from the Arduino is really slow between when the encoders and LCD report the change, and when the string shows up on the serial bus. I'm going to change the encoder code to only print to serial when there is a change to reduce the traffic and hopefully prevent the backlog. It worked! Now I only send serial traffic when there is a change, and response is much faster. Realized I need a function for the Encoder program to tell it to reset it's counters. That is for a Home position command. Added that and updated the position encoder program. Also found a bug that the position counters were unsigned integers!! The LCD calculation seemed right but the serial information signs were mixed up. Fixed it. It is working much better now! I realized I need to be able to calibrate and send a coordinate to the encoders and have them update their math to scale that to the known zero position. I'll do that once I make some progress on other fronts. Set up a GUI to send manual commands to the CNC machine. Functions for Jogging X,Y, and Z by a select-able step size. Turn on and off the tool and change it's speed. Display the encoder's value and the calculated location both. Finally an interpolated move command to calculate the vector to an inputted coordinate. Next I need to go back and clean up the programming for the heavy duty motor driver. I used a bunch of mosfets and random bipolars to convert an Adafruit motor sheild to drive a drill motor. I left this pretty rough. I need to clean up the control sketch for the Arduino and test it out. I set up a slider to control the speed. I'm not sure if I'll do active motor braking or not, depends on how things work. Decided to update the motor controllers and eliminate one of the Arduinos! In the process of resurrecting the heavy duty motor shield circuit, and noticing that my blog post was kinda missing a lot of information, I discovered that Adafruit had updated their motor shield and no longer sold the old one I used. They now support stacking, which I had hacked up before. It's totally cheating to use their shield, and maybe pricey as well, but it will save me a lot of time and what I build will be repeatable by others. Additionally it looks like I could stack and use a single Arduino to run all four motors X, Y, Z, and Tool. They now have a dedicated PWM chip on board. Before as well the load on the Arduino PWM was too much for four motors and I backed off to two Arduinos. I will still need to use the heavy duty Hbridge MOSFETs for the tool motor, but that is a minor mod. I pulled the trigger to upgrade the motor shields to the new version. It will save me an entire Arduino. Too bad I already wrote code, but it will be worth it. I'm rewriting the XYZ Arduino code now to support both the XYZ and the Tool speed and use the new Adafruit v2 motor shields stacked up. Additionally I'm going to change the architecture of the system. Previously I had the Arduino interpreting the HPGL code directly. That was very limiting, but I did it because I didn't know Java at the time. A better approach is to have the PC software do the hard work, and only send specific movement commands to the Arduino. The Arduino will still linear interpolation to move the X and Y motors together to make smooth diagonals. I don't think it's necessary to do linear interpolation with the Z axis. Java program will need to send the following commands to the Arduino. Semicolon indicates command termination and begin executing. Tn; = Set tool speed to n. May be positive or minus. 0 is off. I added each of these commands to the buttons in the Java program. Now I need to jump back to the Arduino to interpret them. I hooked up a tiny DC motor and three hobby steppers to the shields for a mock up to use while I write the code, without worrying about running the motors into a wall, etc. A basic motor party script with both shields worked right off the bat. Now I'm rewriting the motor control program for the Arduino to interpret the simple commands from the Java GUI, rather than try to decode HPGL all by itself. That was limiting the functions I could perform. It didn't take as long as I thought it would, because I was able to reuse the heavy lifting from the old program and just change the command interpretation loops. I still need to add the timeout and error catching stuff but it's working pretty well already! //round to integer number of steps that distance. Step by two to minimize 0 size steps. Fired up the Java GUI and started clicking buttons. It works! All the buttons are doing the right things. Immediately noticed I needed to make some GUI changes though. Things are working with the Java GUI, the busy light comes on, all the motors move the way I want. I'm in business. Here is what it looks like now. It has gotten a bit busy. Next step is to figure out what to do on the calibration page. Start with a calibrated, precisely measured square printed on paper. Now the encoders and counters can calculate the size of their steps in inches/mm. Here is the calibration GUI. Added code to calculate the calibration and reset counters in the Arduinos as needed. Next step is to go back and modify the GUI I previously made for Manual stepping to report values in the calibrated units that calibration measured or in raw steps as it does now. Easy added the multiply to the calculated position display. Alright... now off to figure out how to read and write graphics files. Basic communication and control all seem to be working well with the mockup machine. This is a working version for manual movement of the machines, haven't implemented the file reading and transferring part yet. 'm rewriting my Java PC program. The task remaining is to add the file reading and translation code to my communication and control software. I need to be able to pick up some common format CNC files and execute them. I want to leverage as much as I can of existing software, and just write a simple line by line translator to take an existing file format and convert it to the commands i need to send to the Arduino. I used HPGL last time, but it is a dead language and is no longer supported by many tools and graphics editors. It will be really hard to convert pictures into HPGL. I need something new. .stl – STL is a file format native to the stereolithography CAD software created by 3D Systems. .iges – The Initial Graphics Exchange Specification (IGES) (pronounced eye-jess) defines a neutral data format that allows the digital exchange of information among Computer-aided design (CAD) systems. .obj – OBJ (or .OBJ) is a geometry definition file format first developed by Wavefront Technologies for its Advanced Visualizer animation package. The file format is open and has been adopted by other 3D graphics application vendors. For the most part it is a universally accepted format. .3ds – 3DS is one of the file formats used by the Autodesk 3ds Max 3D modeling, animation and rendering software. Tried to read one of the STL files. It is not in ASCII and GIMP can't open it. So that may not be the best option for me, to write an STL file interpreter. Most people are trying to create these files, not read them. .bmp I have in the past written many programs that read and write .bmp files. The format is pretty simple XY pixels and intensity. I could use bmp as and easy option, but something more vectory seems better. This guy is way ahead of me. I'd have to switch to Linux to borrow his work. G-code is used to run cnc machines at the lowest level. I looked at gcode on wikipedia and it's fairly hairy. Lots of commands to deal with. Starting to think I will write a simple bmp drawer to start with. I want to get the tool running with something. bmp files say their size and have rows and columns of pixels. Easy to read. I can use gimp to create files of any size, scale them, etc to make them suitable. I'll start with black and white bmp files. I need to do some googling to make sure there isn't some tool out there I can borrow. put the pen down on a black dot. I have some old skill code that read bmp files, I will pull that out and use it to start. There is an "autotracing" program on line. But the problem is I would then need to be able to read EPS, SVG or PDF files. Maybe the demo will be enough, but it looks like it costs money. Found another that looks free and online. Takes a graphics file and creates vector files. Tried it, and EPS output looks like a usable, ASCII vector file. DXF file is ASCII readable as well. I'm sure this could get hairy, Autocad is pretty complex. But this file looks manageable. This means Move to 30:3, Line to 30:10, Bezier Curve to a list of coords, z=end. Played with http://www.autotracer.org/ and I'm pretty happy with the files it produces. It is really for 2D drawing but it makes simple vector files that are easy to turn into tool control files. Gimp can read and display them. Looks like a good quickie option to get off the ground. I will need to implement the Curve function in the Arduino, and convert the control letters to match just to make life easier. It has a demo which is a fully functional svg editor that produces similar graphics files that can be edited. Looks like a winner. At this point it seems appropriate to start other posts with this topic, this post is getting too long and covers too much. I'm watching this blog with baited breath. If your encoder could be used first with a probe to map the flatness of a pcb, and then adjust the Z axis Gcode accordingly, you might have designed the best PCB mill yet! This is really interesting and I`m tempted to try it out. In fact ... YES I`m going to try it out ! Thanks for the information. GOOD JOB ! So sorry that you have changed to the new V2motor shields. They are surface mount so I can't really make one myself. I've been following your progress for a while and was hoping that the control java for your sketches would be finessed and usable one day! Have you even considered RAMPS or GeeTech Rumba for this project? You can guide build 3D model using 3D software and make plates of manchine. The information you provided was very useful about cnc 3d printer. I will visit again in the near future. This information was very helpful for me and everyone because you have described point to point about it. I’m very impressed by your work and will recommend your tips to everyone in my circle so that they can also benefit from this information. I was unaware of the facts you mentioned in your article. It is so helpful that I am sure everyone will praise you for sharing this information. Wonderful work. Your Quality Inkjet Refills cartridge is a small marvel of technology, it is used in many home printers such as the DeskJet and BubbleJet printers and is the one item that must be in top shape to guarantee efficient, high quality printing.